Inside this demand is a larger story – a story of arbitrary detention of people, sometimes for years, simply because they are refugees; a story of the utter inhumanity of a government that would sanction the wresting a young child from its mother’s bosom, simply because the mother is a refugee, simply because she demanded her husband’s freedom. In Cyprus, refugees are truly people without rights. 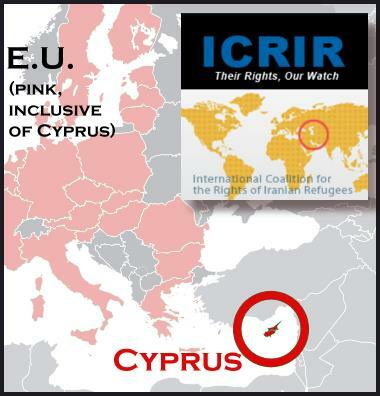 Despite the fact that Cyprus is a member of the European Union, measures taken by the Cypriot authorities in their dealings with refugees – long periods of illegal detention, deprivation of juridical assistance, deprivation of medical care – are absolutely unlawful according to the European Union’s Framework of Human Rights and Fundamental Freedoms. Refugees in Cyprus are only rarely officially recognized as such, which allows Cyprus to economically exploit the labor of refugees: paperless and thus without rights, they are forced to work on the black market for wages little better than slavery, and under inhumane working conditions. When their labor is no longer needed or people known to be refugees have become otherwise “inconvenient,” they are illegally detained in prisons, they are threatened with deportation to Iran where they are at high risk of persecution, or they are, in fact, returned to Iran where some have met with an untimely demise. This was reported to be the case of Masoud Montazeri, an Iranian deported by the Cypriot authorities the 4th of May 2010. Upon his arrival, Masoud was kept in detention for almost 12 hours, during which he was interrogated by police and confronted with pictures of Iranians who are considered as “opponents of the regime.” By September of 2010, refugee rights advocates had learned of Masoud’s death, which, his family believes, was at the hands of the Islamic Republic. Hossein Hossein-nejad Seresty (arc : 5506241), and his wife Roghayeh Hossein Nezadeh (arc : 5506240) have been caught between the lethal criminality of the Islamic Republic, an illegitimate and barbaric regime from which they were forced to flee, and the brutish and nasty inhumanity of the Cypriot government. Like many Iranians who have fled to Cyprus, the family has lived on the island for about 8 years without any status being conferred. Hossein was detained on 16 March, 2010, and according to reports his detention is for no reason other than being paperless. Roghayeh, forced to raise an infant – and then a toddler – by herself, requested Hossein’s release many times, to no avail. In approximately mid-February 2011, she presented herself, with her three-year-old child in her arms, to the police station to demand once more Hossein’s release. She declared that she and their child needed the father to be with them in their home, helping to raise his child, and not suffering in a prison for the “crime” of being a refugee. Distraught, she cried out, “If you won’t release Hossein, then at least let us be together – put us in prison with him!” With that exclamation, it is reported that the authorities at Limassol Prison arrested Roghayeh and put her in the women’s ward. Tearing the three year old from his mother’s breast, they handed him over to an unknown Cypriot family. For a period of time, the child was brought to visit his mother once a week; there, the child exhibited signs of extreme distress from being forced to live with strangers. As a result, both Hossein and Roghayeh wrote a request letter to the immigration authorities asking for them to place the child with an Iranian family known to the child, where the child is now living. Both parents have been on hunger strike to protest the illegal and inhumane removal of their child, and their illegal detention by the Cypriot authorities. Both parents have been hospitalized as a result of their prolonged lack of sustenance. Tragically, we have received news that Roghayeh has fallen into a coma as a result of the hunger strike. While we do not advocate self-harm as a method of protest, it is not hard to understand the depth of pain experienced by this family as a result of prolonged periods of unjust detention; the soul-shattering agony of having their young child ripped away from their love and care – and for no reason other than the vicious whims of the Cypriot authorities. 1- We demand the immediate release of Mr. Hossein Hossein-nejad Seresty (arc : 5506241) and his wife Mrs. Roghayeh Hossein Nezadeh (arc : 5506240) and their immediate unification with their 3-year-old child. 2- We demand the immediate release of all asylum seekers who have been detained on no other grounds than not having a visa or a valid passport. 3- We demand review of our asylum applications, corrections made to our files with the help of a reliable interpreter other than Mr. Khalaj, and new rulings on our cases based on our corrected documents. We further demand that the European Union immediately look into the rampant abuses and human rights violations visited upon refugees in Cyprus. The government of Cyprus is in egregious violation of international law, and must be held responsible for its crimes against refugees. Finally, we repeat and underscore our demand for prima facie status of Iranian refugees. The Islamic Republic has declared that asylum-seekers are criminals propagating against the regime and thus subject to prosecution under Article 7 of the Islamic Penal Code. It is thus unlawful according to jus cogens international law to refoule Iranians back to Iran. There should be no deportations to Iran, nor threats thereof. We have called for protest at Embassies of Cyprus, and various protest actions will take place in the coming days in the United States, Germany, and Belgium. We wish an urgent recovery for Roghayeh so that she may be reunited with her family, in freedom.